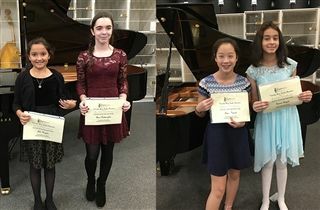 On Saturday, November 3, eighth graders Liana Renard and Emaan Sayied, seventh grader Anna Iordanoglou, and sixth grader Lila Hayden performed on the piano at the Kentucky Music Teachers Association’s State Honors Recital at Campbellsville University. These students were all selected in a preliminary competition to perform with other accomplished young pianists from across Kentucky. In addition, eighth grader Daniel Bronfman performed and received second place in the Kentucky Division of the Music Teachers National Association’s Junior Competition.